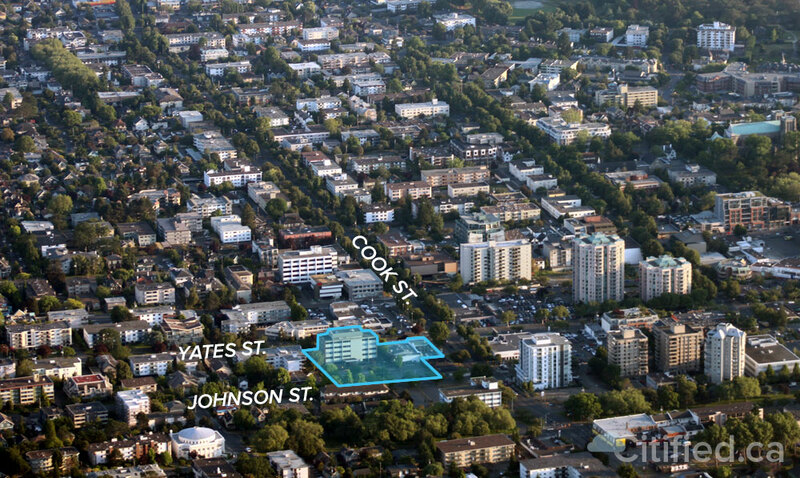 An aerial view downtown Victoria and the Fernwood neighbourhood. 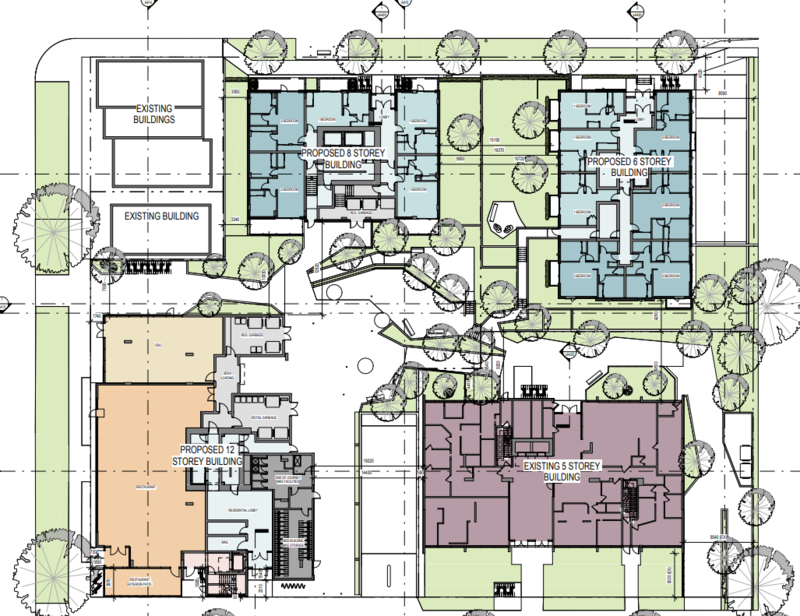 The outline (in blue) of Chard Development's three-building project site between the 1100-blocks of Yates and Johnson streets at Cook Street shows its context within the two districts. I look forward to seeing some renderings. Right. It’ll be retained and upgraded. No attachments are in the system yet, but it looks like a hard has filed for resining and a development permit for this property (1100 Yates). So are things clear or is it a sticky situation? Plans are now up. Developer is Chard, architect is Proscenium. This project is referred to as Cook Street Plaza in the plans. Edited by Jackerbie, 14 December 2018 - 12:22 PM. 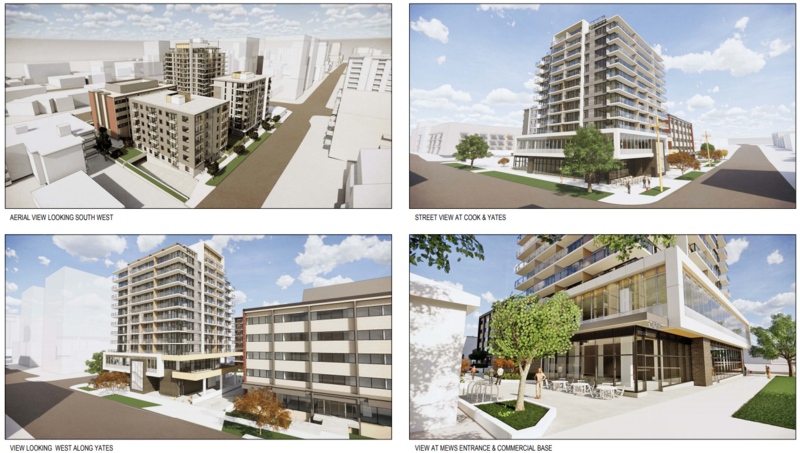 I notice the "no-go" shacks at the corner of Cook & Johnson are mostly absent from the above renderings. This will be a good addition for the neighbourhood. Unless the SJW's on Victoria council hold the project hostage for all "affordable" rentals. And let's not forget the Fernwood NIMBYs who will likely present both gentrification and height as issues. Assuming it gets built anything like the renderings. Well this is also Fernwood so will be interesting to see what they have to say about the height. DRA did not like the height across the street from this. I want to see some more pictures but I am liking this first look. Of note is Chard's use of Proscenium. This is the first time he's used their services for a local project, and other than using DHK for the four-storey Duet building and the Duck's Block/Canada Hotel development, the architectural firm has been exclusively MCMP. The medical building and the building behind it look like they'll be almost touching. Anyone who wants to fire pellets at the taller condo building from back there would have a very narrow line of sight. They do look reaaally close, even when you consider that one of them is 5 storeys and the other is 6, so there's an illusion of equal height because of the perspective. According to the drawings, the buildings are 13.77 m (45') apart. The overhead view is more forgiving. 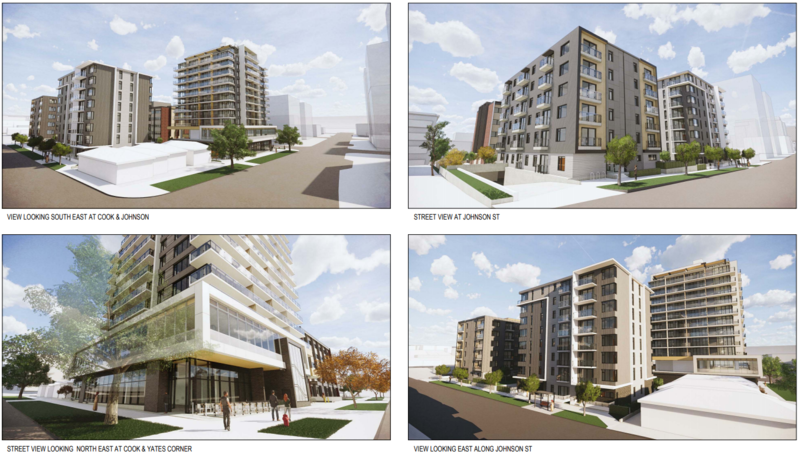 If the 12-storey building gets chopped down, this project will be abysmal. Of note is Chard's use of Proscenium. I thought you meant his use of the word 'proscenium'. it's the area between the orchestra & the curtain in a theatre, so I guess he's saying that if you're travelling into town on yates st, cook is the curtain, and past there is the stage, where all the action happens. actually just across the street is pacific mazda, where that jawl project is, the one with the fire hall, etc. then a block away is the mondrian & the wade. that's going to be a pretty lively neighbourhood when it's all done.